A mint julep is traditionally made of four ingredients: mint, bourbon, sugar and water. In the use of sugar and mint, it is similar to the mojito. In preparing a mint julep, a fresh mint sprig is used primarily as a garnish, to introduce the flavor and aroma through the nose. If mint leaves are used in the preparation, they should just be very lightly bruised, if at all. However, proper preparation of the cocktail is commonly debated, as methods may vary considerably from one bartender to another. Mint juleps of the past were typically served in silver or pewter cups, and held only by the bottom and top edges, which is a maneuver that allows frost to form on the outside of the cup. In Kentucky, the difference between a glass and a cup are quite different. The Kentucky Mint Julep Cup can trace its origins to early American silversmiths, and has remained to be a symbol of achievement, esteem and prestige. In fact, people have proudly used their cups to celebrate personal events outside of the Derby itself. 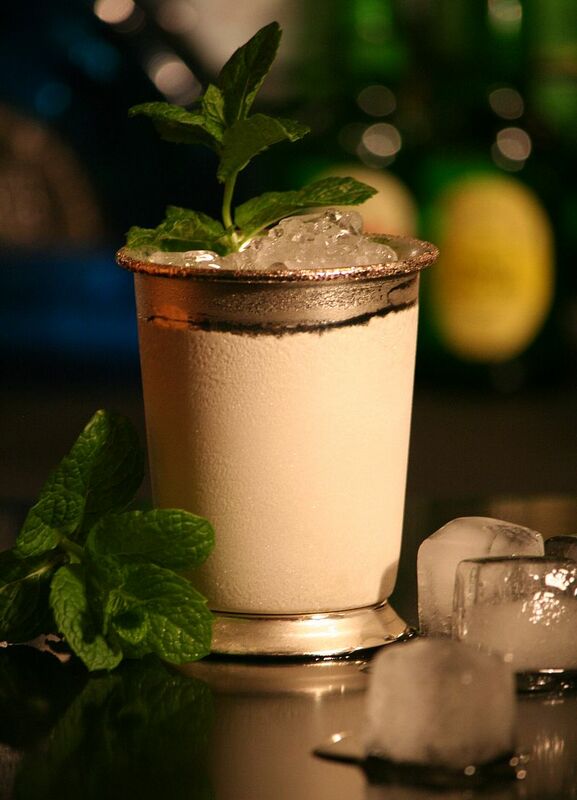 Glasses were created after Derby-goers kept stealing the paper cups that their mint juleps were typically served in. In 1939, Churchill Downs (the racetrack which is famous for hosting the derby) fixed the issue by creating the Kentucky Derby Mint Julep Glass that allowed for people to keep -and pay for- the souvenir that’ll help them remember their visit to the Kentucky Derby. Today, you can also find them served in old-fashioned glasses, or highball glasses with a straw. The mint julep was first introduced as a prescription, back in the the late 1700′s – many pieces of older literature described using the cocktail to help ease sore stomachs. Years later, U.S. Senator William Clay, from Kentucky, introduced the drink to Washington, D.C. during his stay in the big city. Yet it was probably the derby which helped transition the drink from a medicine, to a cocktail used for big, classy celebrations. ← Boris Karloff meets Frankenstein’s Monster 1931.